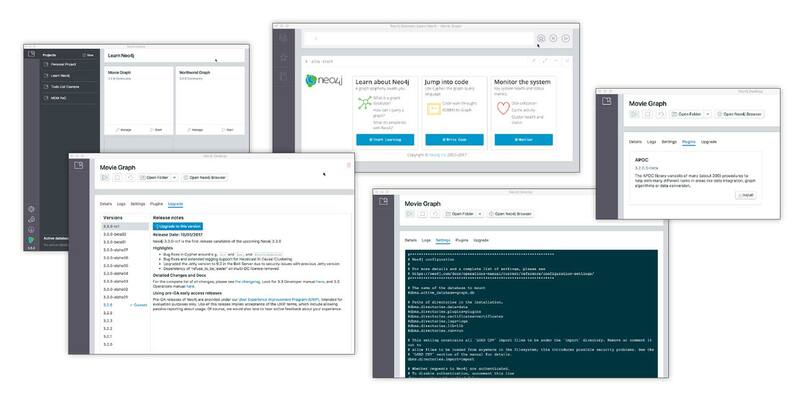 Neo4j’s Graph Platform is bringing a connections-first approach to applications and analytics across the enterprise. The graph platform takes a connections-first approach to data. It broadens a company’s ability recognize the importance of persisting relationships and connections through every transition of existence: from idea, to design in a logical model, to implementation in a physical model, to operation using a query language and to persistence within a scalable, reliable database system. The foundation of representing connected data is known as a graph. The age of connections started long before Millennials, yet they typify the world’s appetite for connections. Trends like social, mobile, analytics and cloud – as well as tomorrow’s aspirations towards autonomy, IoT and deep neural networks – are all dependent on increasing data connectedness. And yet, it remains extremely difficult for modern data stacks based on SQL and NoSQL to divine how data elements are related. The truth is that relational database JOINs are expensive and NoSQL databases trade inalienable functions like data consistency and transactions for raw speed and scale, all of which causes headaches for developers, IT and data scientists, and all but ignores business users and executives. The Graph Platform fits seamlessly into enterprise data architectures, alongside, around and above relational warehouses, data lakes, cloud and legacy systems. In fact, many customers have deployed Neo4j to augment their existing infrastructures without interrupting everyday operations. Yesterday's breakthrough applications were driven by big data – tomorrow's breakthrough applications will be driven by connected data. No longer powered merely by data transactions, these applications draw together every system across the entire enterprise. These networks of related data are known as graphs. 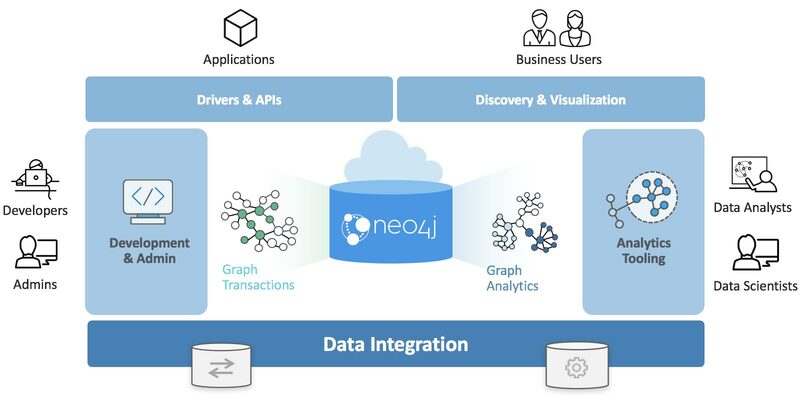 Neo4j’s Graph Platform is the fastest path available to operationalize enterprise analytic insights by connecting the work of big data IT to data scientists to application developers building impactful killer apps. This is where artificial intelligence starts – through applications that make connections born from thoughtful algorithms upon a growing network of data assets. Performance from compiled Cypher, enterprise lock management and space reuse. Exposure to production deployment features like HA & DR clustering, secure Causal Clustering, IPv6 and least-connected load balancing. The amount of time these features save a developer is astounding, and now it's all available free with registration. There's no denying: Other data stores have their appropriate use cases. But whenever your enterprise wants to leverage the connections between data points, you need to tap into the power of Neo4j. Data Storage Storage in fixed, pre-defined tables with rows and columns with connected data often disjointed between tables, crippling query efficiency. Graph storage structure with index-free adjacency results in faster transactions and processing for data relationships. Data Modeling Database model must be developed with modelers and translated from a logical model to a physical one. Since data types and sources must be known ahead of time, any changes require weeks of downtime for implementation. Flexible, "whiteboard-friendly" data model with no mismatch between logical and physical model. Data types and sources can be added or changed at any time, leading to dramatically shorter development times and true agile iteration. Query Performance Data processing performance suffers with the number and depth of JOINs (or relationships queried). Graph processing ensures zero latency and real-time performance, regardless of the number or depth of relationships. Query Language SQL: A query language that increases in complexity with the number of JOINs needed for connected data queries. Cypher: A native graph query language that provides the most efficient and expressive way to describe relationship queries. Transaction Support ACID transaction support required by enterprise applications for consistent and reliable data. Retains ACID transactions for fully consistent and reliable data around the clock – perfect for always-on global enterprise applications. Processing at Scale Scales out through replication and scale up architecture is possible but costly. Complex data relationships are not harvested at scale. Graph model inherently scales for pattern-based queries. Scale out architecture maintains data integrity via replication. Massive scale up possibilities with IBM POWER8 and CAPI Flash systems. Data Center Efficiency Server consolidation is possible but costly for scale up architecture. Scale out architecture is expensive in terms of purchase, energy use and management time. Data and relationships are stored natively together with performance improving as complexity and scale grow. This leads to server consolidation and incredibly efficient use of hardware. Data Storage No support for connected data at the database level. Performance and data trustability degrade with scale and complexity of connections. Native graph storage structure with index-free adjacency results in faster transactions and processing for data relationships. Data Modeling Data model not suitable for enterprise architectures as wide columns and document stores do not offer control at the design level. Puts undue pressure on the application level to catch and solve problems. Flexible, "whiteboard-friendly" data model allows for fine-grained control of data architecture. Intuitive data model eases communication between developers, architects and DBAs. Query Performance No graph processing capability for data relationships, thus all relationships have to be created at the application level. Native graph processing ensures zero latency and real-time performance, regardless of the number or depth of relationships. Query Language Query language varies, but no query constructs exist to express data relationships. Cypher: A native graph query language that provides the most efficient and expressive way to describe relationship queries. Transaction Support BASE transactions lead to data corruption because basic availability and eventual consistency are unreliable for data relationships. ACID transactions ensure data is fully consistent and reliable around the clock – perfect for always-on global enterprise applications. Processing at Scale Optimized for ingesting data but not reading data at scale. Scalability depends on scale out architecture that does not protect the integrity of graph-like data, so data is not trustworthy. Native graph model inherently scales for pattern-based queries. Scale out architecture maintains data integrity via replication. Massive scale up possibilities with IBM POWER8 and CAPI Flash systems. Data Center Efficiency Scale out architecture assumes ongoing access to more and more commodity hardware without accounting for energy costs, network vulnerabilities and other risks. Data and relationships are stored natively together with performance improving as complexity and scale grow. This leads to server consolidation and incredibly efficient use of hardware.